Le calme absolu en cette période, la courtoisie de l'accueil, une mise à disponibilité de la chambre malgré mon arrivée assez tardive Je n'ai pu y faire qu'une nuit, mais c'est un endroit fort agréable. Das Personal war sehr freundlich und hilfsbereit. Die Lage zum Meer ist günstig. L'accueil. Le parking, La proximité de la plage. La piscine. Pt'it déj copieux avec jus d'orange pressée. La vue et le calme. Ottima posizione con spiagge, parcheggi e anche il porto dove partono diversi traghetti tutto raggiungibile a piedi in pochissimi minuti. Bonjour endroit calme. Proche plage et port pour des excursions. Résidence Odalys L'Ile d'Or is located 1.2 mi from La Londe-Les-Maures’ city center and a 5-minute walk from l’Argentière sandy beach. The ferry port is a 10-minute walk away, from there you can visit both Port-Cros and Porequerolles Islands. The air-conditioned apartments and suites feature a flat-screen TV, free WiFi access, a private bathroom and a kitchenette with a dishwasher. Some apartments are suitable for disabled guests. At Résidence Odalys L'Ile d'Or you will find an outdoor swimming pool, a fitness center, a spa, a restaurant, a bar, a tennis court and a tennis table. Additional facilities include bicycle storage. Bicycle rental is possible on site. 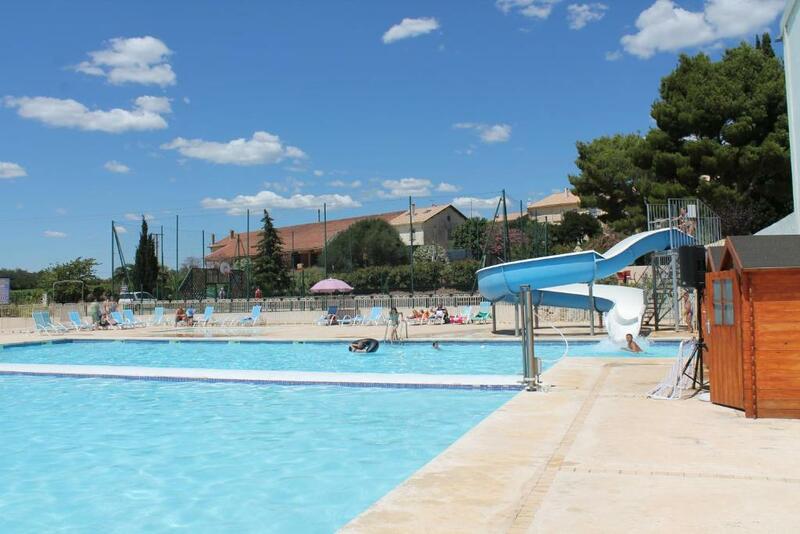 During July and August, a kids’ club and swimming lessons for children are available. Guests can enjoy a buffet breakfast every morning upon reservation. The property is within 8.1 mi from Hyères Train Station and Toulon – Hyères Airport. The Fort de Brégançon is 6.2 mi away. When would you like to stay at Résidence Odalys L'Ile d'Or? This air-conditioned apartment includes a living room with a sofa bed, a bedroom, and an equipped kitchenette with a stovetop and microwave and a dishwasher. This air-conditioned apartment includes a living room with a sofa bed, 2 bedrooms, an equipped kitchenette with a stovetop and microwave and a dishwasher. House Rules Résidence Odalys L'Ile d'Or takes special requests – add in the next step! All children under 2 years are charged EUR 25 per person per night in a crib. Résidence Odalys L&#39;Ile d&#39;Or accepts these cards and reserves the right to temporarily hold an amount prior to arrival. Résidence Odalys L'Ile d'Or accepts these cards and reserves the right to temporarily hold an amount prior to arrival. Reception opening hours vary from low-season to high-season. For reception opening times, please contact the hotel directly. The bed linen set includes sheets and pillowcase and the bathroom linen set includes terrycloth towels and bath sheets. End of stay cleaning and TV are not included in the room rate. Guests must either choose the end of stay cleaning service (on request and at an additional cost) or clean the apartment before leaving. It was quite noisy and there was no balcony. The property was nice and tidy. No satisfactory place for parking our own bicycles. No shop available inside the residence.